Gained like 10 FPS in Armored Kill maps, BF3 seems to be way smoother, me likes. Working flawlessly here on DiRT3 and NFS The Run , objects and overall everything looks better , sharper image , fps stay the same but image quality really improved. No problems to report runnig Crossfire 2x HD6950s. Good Drivers , Keepers for me . every newer driver since...can't use any OC tool without creating a 2d fix via ccc preset. Need to set mem speed to 1300 in all modes. It feels like I'm out of the alpha drivers phase of these CGN graphics cards!!! p.s. Batman Arkham City and Crysis2 over abused of tessellation ! OMG ! ex: In Arkham City, If i stick my face to the church's exterior walls or the big robot dinosaur in the museum entrance@1440p: 100% GPU utilisation and 15 FPS ! Good drivers. Min fps in BF3 went up from 45fps when high up in jets which was the lowest I saw with 12.8 with these lowest Ive seen is 50fps.. only 5fps more but hey its an improvement. This is all at ultra 1080p. I normally only play on high though, with motion and dof disabled as I hate these effects and normally got 62fps min but with these drivers its 68fps min. Keepers. Will test more games later. Has anyone tried these in borderlands 2? Not here, im on Ultra all round and its all working normal. Great post. I totally agree with you. While past sets worked, they had bugs. This set is flawless for me as well. This GCN driver is definitely the proper driver we have been waiting for. 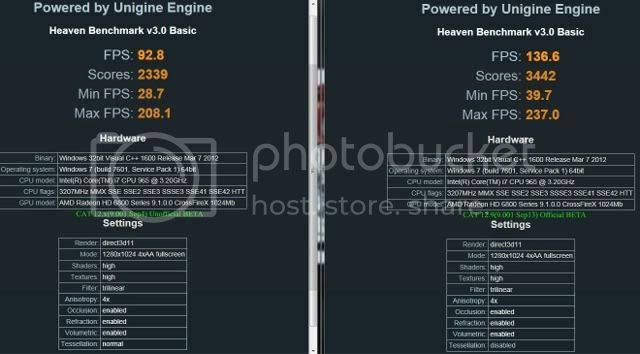 Reading through many forums Nvidia/AMD/ATI alike, it's pretty apparent that both companies released their cards wayyyy before their drivers were ready for them. Nvidia is having driving issues, as well as AMD on their new cards. Nvidia's adaptive Vsync is still having issues even now. They are working on totally redoing the drivers for it. Well, I hope both companies learned a lesson from releasing hardware too early, or falling behind in driver development. Probably because yours is not a 7970. It simply means the driver works fine with your card on Skyrim, but not with a 7970. Did you put the leak driver 12.8 or later? varied textures. Im just curious How crossfire 79 are with that CPU since its about the same as mine. Ive seen alot of Intel NVIDIA fanboys claim dual gpus on amd CPU to not be worth it. Too bad we cant crossfire cpus lmao. But yeah i was thinking about crossfiring sooner or later. Points to atiumd64.dll. It doesn't happen everytime, about 50/50. When it does it happens within the first 2-3 minutes playing. Replace that file from modded drivers. Thanks Asder, these are working flawlessly on my newly built Rig.
. Im just curious How crossfire 79 are with that CPU since its about the same as mine. Ive seen alot of Intel NVIDIA fanboys claim dual gpus on amd CPU to not be worth it. Too bad we cant crossfire cpus lmao. But yeah i was thinking about crossfiring sooner or later. While fast CPUs are vital for most applications, the moment you choose an high resolution with a lot of Anti-aliasing + TransparenciesAA, you'll need the most powerful GPU you can get. The GPUs matter really much in high resolutions. With this mother board, I had at first 2 radeon 5870, after I switched to 2 radeon 6970 and then HD 7970 and at each upgrades, I perceived clear improvements with the FPS and images quality. While old games like Left4dead and Bioshock/Unreal Tournament3 can run perfectly with a single GPU, some titles are so heavy to render (Crisys2, metro2033) that having 2 Vcards almost double your FPS and still can make 2 overclocked 7970 not powerful enough (with 100% GPU utilization) to have 60 constant FPS, let alone 120 for the more sensitive persons. These cards are still often not powerful enough to use supersampling AA in many titles. While more often, we hear people concerning about CPU bottlenecks, I always faced and still facing GPU-limitations even with the latest generations of video cards. A better CPU will not help very much more when you have your GPU already at 100% utilization in a particular game. I , for video games, personally prefer a weak (not too) CPU and extreme video cards combo more than extreme CPU + weak GPU ! The Radeon Hd7000 offer the best graphics I ever saw with good anti-aliasing but also the best Anisotropic Filtering I ever experienced, which keeps the distant textures sharp and precise with minimum shimmering at every angles! Only 8 months of waiting and experiencing issues with a 1000$ investment.... not to bad ! Thx for the info. Could you point me in the direction of the modded drivers you are referring to? - these are showing a considerable improvement over the previous BETA..
- to my eyes, the colouration in Skyrim via 12.x(4Sep) was superb..
- BF3: Battlefield 3 certainly feels better, but the 12.x(4Sep) was excellent here, also..
- further real-world game testing ongoing.. So no one elses GPU scaling is borked? It only happens to me on 9.00+ drivers (including the June one back when I had Windows 7). Now happening to me on Windows 8 (fresh install)? Or no one elses RGB mode gives massive display corruption (the Y.... color mode doesn't have it. When I say those options give display corruption I mean the entire screen is basically inverted and fked. Purple color, weird ringing. On any game running at a lower resolution than native this happens to it too. So windows desktop and low res games have this issue. Have you tried removing ALL AMD/ATI drivers and CAPS then running a driver cleaner? Sometimes left over files from previous versions when there is a big change in the driver, CAN create unwanted issues.